I’m helping out with Group A’s Secret Recipe Club Reveal today! I was assigned Erin’s blog, Table for Seven! Table for Seven is a new blog to me and I was so surprised to see how many similarities there are between Erin and me! Erin and I started our cooking journeys in a similar fashion. Both of us began cooking when our oldest children were picky eaters! Erin is a mom of 6 – 5 here on earth and one angel baby (I’m a mom of 3 – 2 here on earth and one angel baby). Both of our angel babies are girls, though Erin’s sweet Eliza spent 1 month on earth before going to heaven and my little Sarah Catherine was stillborn. Sorry, I got a little heavy there, but it always comforts me to “meet” other grieving mothers out there. Let’s talk yummy food now, ‘kay? Erin makes my kind of food! I wanted to make everything I came across, but as I had already pulled a pork roast out of the freezer, I was pretty focused on the pork recipes! But when I have time, I’m totally going to the desserts! In particular, Chocolate Caramel Squares, Salted Caramel Hot Cocoa, Pumpkin Pie Hot Cocoa (be still my heart! ), and Turtle Cookies! Can you tell how excited I am about these recipes? I cannot stop using exclamation points!!!! Like I mentioned before, I was already planning to make a crockpot pork roast of some sort, but didn’t have an actual plan for it, so I was super excited to find all sorts of crockpot pork recipes on Table for Seven! I ended up choosing Pulled Porkwith Carolina BBQ Sauce because A) it sounded amazing and B) I had all of the ingredients on hand. I was a little nervous about the mustard based BBQ sauce (Hubs is not a mustard fan) so I halved the amount. However, Hubs was pleasantly surprised and quite enjoyed the sauce! Half the amount was still perfect for our family, but if you like saucier sandwiches, double the amounts below or check out the original recipe at Table for Seven. Season the pork liberally the salt, pepper, and the garlic powder. Place in a 4 quart slow cooker and add the vinegar, chicken broth, and liquid smoke. Cook on low for 9 hours or high for 4 ½ hours. Shred the pork, set to warm and allow to rest for 30-45 minutes before serving. Meanwhile, make the BBQ sauce. Place the mustard, sugars, vinegar, water, and chili powder in a small saucepan and whisk together. Bring to a boil, then immediately reduce to a simmer. Simmer for 30 minutes, stirring occasionally. Stir in the soy sauce, liquid smoke, and butter and simmer for another 10 minutes. Season with black pepper, if desired. 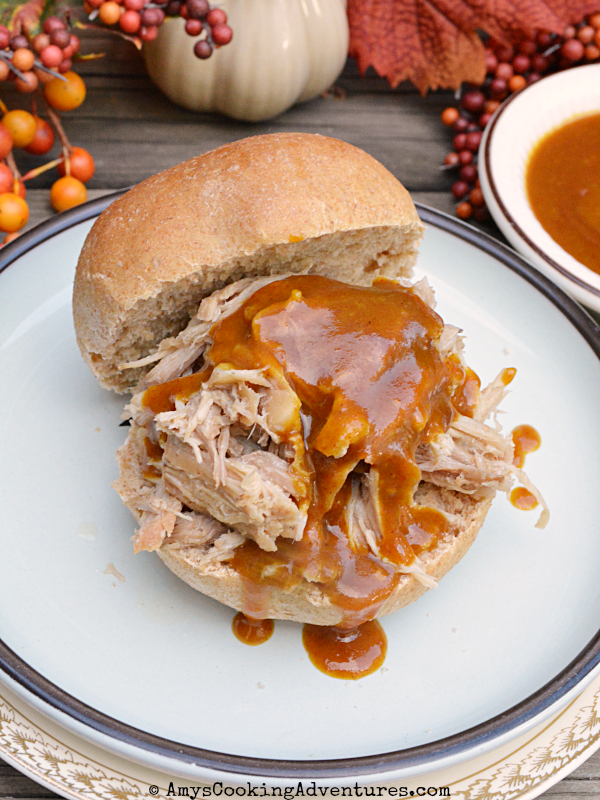 Serve the pork over homemade buns and top with Carolina BBQ. This sounds amazing! I know I just used an explanation mark, but seriously. What a great choice. How serendipitous that you and Erin have so much in common too. 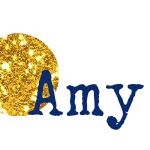 Sweet post Amy xoxo. I absolutely need to try out that sauce! 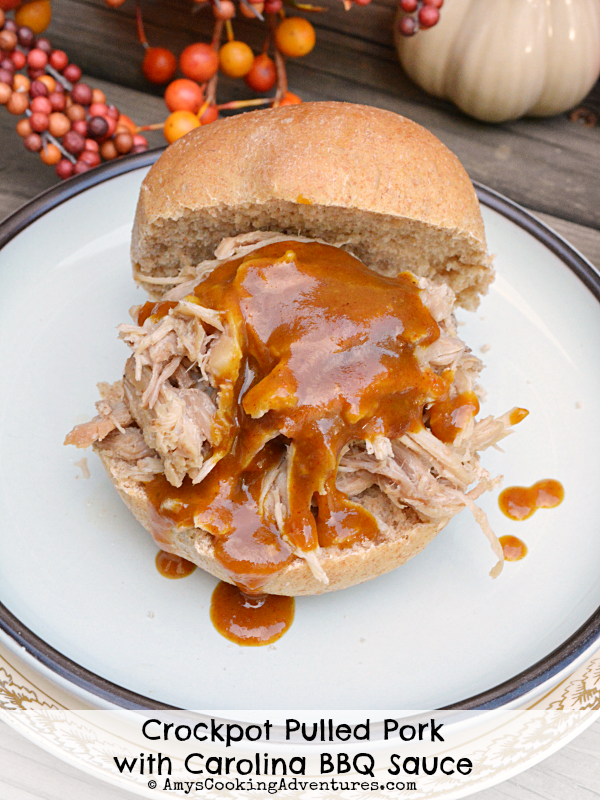 Pulled pork is one of our favorite dishes EVER! I am always trying to find different takes on it, so I am pinning you right away! Anything that can be made in the crockpot is a winner in my book. I really need to try making my own barbecue sauce. That sounds really good. I have been craving pulled pork. These sandwiches look delicious. I love that it is a crock pot meal. Just what this busy momma needs. Happy Reveal Day! What a nice post. Thank you for sharing something so personal. I truly am sorry for your loss. Your dish looks DELICIOUS. I think it might be time to pull out my dusty crockpot! That looks so good. Great choice for stepping in, love the Carolina BBQ sauce as well. That sauce looks perfect.